Without the rise to power of Germany’s National Socialist regime in 1933, Robert Gilbert would hardly have imagined that he would someday acquire American citizenship, let alone play a role in the cultural exchange between Europe and the United States. However, both his Jewish identity and his political opposition to the Nazi movement forced him to leave Germany—first to Vienna in 1933, then to Paris in 1938, and finally to New York in 1939. After his return to Europe in 1951, he came to play an important (yet forgotten) role in the translation and transfer of American popular culture to Europe. Robert David Winterfeld was born in the poor eastern part of Berlin—Warschauer Strasse, “above the horse stables”—in 1899. He was the son of Max Winterfeld, a circus orchestra conductor and composer, who had changed his name to Jean Gilbert and, with one successful operetta—Die keusche Susanne in 1912—managed to fulfil the “Berlin dream” of moving westward and living in a villa on the Wannsee shore. After fighting in World War I, Robert returned a pacifist and a socialist. He had inherited his father’s musical talent and hoped to put it to use supporting the political left in Weimar Germany. His song “Stempellied,” in the interpretation of Ernst Busch, became an icon for Germany’s worker’s movement, an indictment of the capitalist system and of “those above” for sending the unemployed masses into misery and despair. Gilbert collaborated with the composer Hanns Eisler and performed at festivals for “New Music,” for example in Baden-Baden 1927. During these years he also established a life-long friendship with the philosopher Heinrich Blücher. After getting married for the first time and with the aim of earning serious money, Gilbert started to work for movies and operettas and, within a very short period of time, became Germany’s most prolific and highest-earning songwriter. With Werner Richard Heymann (1896–1961), Gilbert wrote the songs for Die drei von der Tankstelle (“Ein Freund, ein guter Freund” and “Liebling, mein Herz lässt Dich grüßen”), for Der Kongreß tanzt (“Das gibt’s nur einmal” and “Das muß ein Stück vom Himmel sein”), and for Ralph Benatzky’s Im weißen Rössl he wrote the songs that made the play so successful: “Im Salzkammergut, da kammer gut lustig sein” and “Was kann der Sigismund dafür, dass er so schön ist.” In the period that ended so abruptly in 1933, Gilbert was a major actor in and contributor to Germany’s popular music industry. Recent research has shown that thriving exchange and dialogue about musical entertainment took place between Europe and the United States in the early decades of the twentieth century; while shows and plays on Broadway borrowed from the European (and especially Austrian) operetta, the new American musical innovations in turn influenced and inspired the short-lived but intense heyday of ambitious and sophisticated German popular and entertaining culture. Erik Charell, the director of Im weißen Rössl, had visited the United States in the 1920s where he saw the Ziegfeld Follies on Broadway and imported the ideas of big revues, chorus lines, and dancing troops back to Germany. As noted by François Genton, “around 1930, a popular culture emerged in Germany which was modern, part of the avant-garde, but at the same time conscious of tradition, and leading the field in Europe. Many of the protagonists of this culture were educated and qualified German Jews.” It is hard to say, in hindsight, if this engagement with the lighter muses conflicted with Gilbert’s left-wing political attitudes—he, together with others, managed in any case to add a number of provocative and ironic elements to Benatzky’s show, including the competition between a Jewish and an non-Jewish producer of male undergarments, both of whom spend their holidays in Kaiser Franz Josef’s Austria. Following the new rulings of the Reichskulturkammer in the spring of 1933, most—though indeed not all—of the artists connected to those movies and shows emigrated, at first (with a hope of return) to neighboring countries, but ultimately to the Americas. 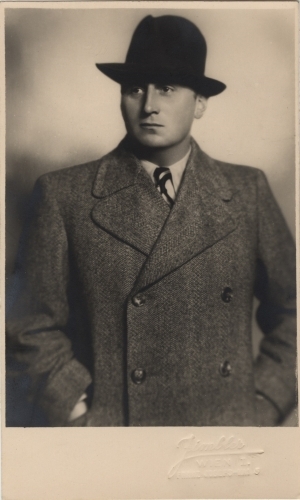 Initially Vienna provided Gilbert and other expellees with venues for performances and colleagues—such as Hermann Leopoldi (1888-1959) and Rudolf Weys (1898-1978)—to collaborate with, as well as a related language for the writing of songs. The year following Austria’s 1938 Anschluss was marked by the typical, yet still very individualized, experiences of emigration: searching for jobs and accommodation, applying for visas and affidavits, the loss of German citizenship. In Paris, Gilbert reunited with his wife and daughter, met up with Heinrich Blücher (along with his new partner Hannah Arendt) again, and managed to gather all the documents needed to board a ship from Cherbourg to New York. The family settled in the Bronx and, for the next twelve years, 51 West 236th Street in Riverdale became a home away from home. While the memoirs of Gilbert’s daughter—published in English as “Memories of a Mischling: Becoming an American” (2002) and translated into German under the title “Das gab’s nur einmal. Verloren zwischen New York und Berlin” (2007)—give the impression that only she, Marianne Gilbert Finnegan, managed to “become an American” whereas her parents, and especially her father, remained stuck in exile circles, Robert Gilbert’s letters to Rudolf Weys and papers documenting his collaboration with Hermann Leopoldi in New York tell a slightly different story. Transitioning his career to another country was an experience fraught with challenges. “Das ist ein verflucht hartes Land” (this is a damned tough country), Gilbert wrote to Weys in June 1939. Some former colleagues, among them the emigrated members of “Die Leute vom Naschmarkt,” a Viennese musical comedy group founded by Weys in 1933, seem to have some success—he adds with a hint of skepticism—by performing their old sketches in English. The need to learn the new language was as obvious as the need to develop new topics and adopt a new style in songwriting. A mere translation of German or Austrian traditions would neither provide enough material, nor enough income. It is true that we find Gilbert’s name mainly in émigré sources such as the German-language newspaper Aufbau for which he sometimes wrote and where “German” or “Austrian evenings” and tributes to European artists—among them Robert’s father Jean Gilbert who had become the conductor of a radio orchestra in Buenos Aires, where he died in 1942—were advertised. But Gilbert tried—and managed, to a degree—to go beyond the German and Austrian émigré circles that included the likes of Bavarian novelist Oskar Maria Graf and Viennese actor Jimmy Berg. He didn't follow the example of other friends who traveled on to Los Angeles, where Werner Richard Heymann, his congenial composer partner from 1931, was quite successfully writing music for Hollywood movies (e.g. for Ernst Lubitsch’s To Be or Not to Be). Music is an international language—but for the writer of poetry and songs “wär’s halt gut, wenn man Englisch könnt’.” This is the title of a song Gilbert and Leopoldi wrote together in 1942/43 to capture everyday situations (meeting people, dating a girl, trying to find a job) in which—as the title says—it would be good to know the English language. The lyrics are basically German, but in this song, and in many others that followed, English idioms and phrases find their way into the text—as they did into the lives of these émigrés. As Europe became more and more cut-off during the war, Gilbert strove to make the United States his new home. The only book he published during his time in New York was a collection of poetry in the German language, “Meine Reime—deine Reime,” for which Hannah Arendt, in her “Menschen in finsteren Zeiten,” called Gilbert “the successor [Heinrich] Heine never had”—this was the most positive, but unfortunately also one of the very few reviews the book received. But, again, the unpublished poems and songs show an effort to integrate American culture into his work, and to “become an American.” In Gilbert’s own view, this has worked quite well; in a February 1951 letter, he writes: “As far as I am concerned, I have been living in New York since 1939, I have my permanent residence there, since I have become, as I like to say, not just an American but a Native American.” Judging from the few letters and documents kept today in Berlin’s Academy of the Arts, Gilbert’s feeling of having “arrived” reflects his personal and family situation much more than his professional career as he never managed to entirely integrate himself into the American musical industry. Europe, in these years, seemed very far away; it was nearly impossible to receive news from friends and relatives as the whole continent was under Nazi occupation, a black hole that had destroyed the flourishing culture of the past unless it had, in tiny trickles, escaped to so many places of exile. Still, Gilbert made the journey back across the Atlantic after World War II. He left the United States in 1949, with the initial intention of only finding work in Europe, but remaining a U.S. citizen and a resident of New York. Things turned out differently due mainly to a new area of work that opened up, seemingly by chance, when Franz Arnold (1878–1960)—for whom Gilbert had written songs before 1933—contacted him in 1951 and suggested that Gilbert should try his hand at translating American musical comedy. From then on, the songwriter’s transnational and translational experience started to pay off. In 1958, Frederick Loewe, the composer of the musical “My Fair Lady”, asked Gilbert for a German translation. Letters exchanged between Loewe in New York and Robert Gilbert in Switzerland provide a wonderful glimpse into the cultural practice of transatlantic translation: “Dear Robert, I know that this is going to be tough work but we must not forget that it is MY FAIR LADY, which means it must be perfect and that there is no time limit on this. Please be not disappointed and keep on trying.”  From the early 1970s on, Gilbert—now based in Minusio, Switzerland and very decidedly not in Germany again—translated around twenty popular American musicals into German. Through his adaptation and moderation of English and German dialogue in plays such as “Annie Get Your Gun,” “Oklahoma,” and especially “Cabaret” (his last translation in 1970), Gilbert helped to bring American popular culture to Europe and to make it accessible to an audience he both knew and at the same time felt removed from. Remaining in close touch with friends and colleagues who decided to stay in the United States, especially Hannah Arendt and Heinrich Blücher, he led a life of cultural inbetweenness and constant translation. He had indeed acquired enough of the new language and the American style of songwriting to be able to participate actively in the transfer of American postwar popular culture to Europe, and to contribute to the return of modern, avant-garde culture once driven out, together with him, from Germany. Robert Gilbert, “Leierkastenodyssee,” in Mich hat kein Esel im Galopp verloren. Gedichte aus Zeit und Unzeit. Mit einem Nachwort von Hannah Arendt (Munich: R. Piper & Company, 1972), 103. Stempellied (Lied der Arbeitslosen), Text: David Weber (= Robert Gilbert), Music: Hanns Eisler. Erinnerungsort.de – Materialien zur Kulturgeschichte, accessed August 5, 2013, http://erinnerungsort.de/stempellied--28lied-der-arbeitslosen-29-_171.html. This is documented in Gilbert’s successful application for material compensation of losses suffered on the grounds of Nazi persecution. See: Landesamt für Entschädigung Berlin, Akte Robert Gilbert, 50836, M5. Germany 1930, Director Wilhelm Thiele. See: Die Drei von der Tankstelle. Ufa-Magazin Nr. 9 (Berlin: Deutsches Historisches Museum 1992). Germany 1931, Director Erik Charell. See: Joachim Reichow, “Der Kongreß tanzt,” in Deutsche Spielfilme von den Anfängen bis 1933. Ein Filmführer, eds. Günther Dahlke and Günther Karl (Berlin: Henschel Verlag, 1993). Premiered on November 8, 1930 in Berlin’s Großes Schauspielhaus, Director Erik Charell, starring Max Hansen and Camilla Spira. See: Helmut Peter and Kevin Clarke Im weißen Rössl. Auf den Spuren eines Welterfolgs. (St. Wolfgang: Weisses Rössl, 2007); Ulrich Tadday, ed. Im weißen Rössl. Zwischen Kunst und Kommerz. Musik-Konzepte 133/134 (Munich: Edition Text & Kritik, 2006). Kevin Clarke, “Im Rausch der Genüsse. Erik Charell und die entfesselte Revueoperette im Berlin der 1920er Jahre,” in Glitter and Be Gay. Die authentische Operette und ihre schwulen Verehrer, ed. Kevin Clarke (Hamburg: Männerschwarm 2007); for Charell’s experience with the American Ziegfeld shows see: "Interview zur Charell-Ausstellung in der September-Ausgabe von Orpheus," accessed August 28, 2013, http://www.ralph-benatzky.de/main.php?cat=6&sub_cat=16&task=3&art_id=000330. François Genton, “Ein Freund, ein guter Freund… oder: Freundschaft in Krisenzeiten. Zur Geschichte eines Motivs in der Unterhaltungskultur Deutschlands, Frankreichs und Nordamerikas (1930–1938),” in Lied und populare Kultur / Song and Popular Culture. Deutsch-französische Musiktransfers / German-French Musical Transfers. Jahrbuch des Deutschen Volksliedarchivs Freiburg, eds. Michael Fischer and Fernand Horner (Münster: Waxmann, 2012), 325. Letter from Robert Gilbert to Rudolf Weys, June 24, 1939 in: Nachlass Rudolf Weys, Rathausbibliothek Wien. Hannah Arendt, Menschen in finsteren Zeiten, ed. Ursula Ludz (Munich: Piper, 1989), 291. Letter from Frederick Loewe to Robert Gilbert, November 20, 1958, in: Akademie der Künste Berlin, Archiv Darstellende Kunst, Bestand Robert Gilbert, Nr. 62, Korrespondenz von Frederick Loewe. Gilbert, Robert. “Leierkastenodyssee.” In Mich hat kein Esel im Galopp verloren. Gedichte aus Zeit und Unzeit. Mit einem Nachwort von Hannah Arendt, 101–132. Munich: R. Piper & Company, 1972. Arendt, Hannah. Menschen in finsteren Zeiten. Edited by Ursula Ludz. Munich: Piper, 1989. Genton, François. “Ein Freund, ein guter Freund… oder: Freundschaft in Krisenzeiten. Zur Geschichte eines Motivs in der Unterhaltungskultur Deutschlands, Frankreichs und Nordamerikas (1930–1938).” In Lied und populare Kultur / Song and Popular Culture. Deutsch-französische Musiktransfers / German-French Musical Transfers. Jahrbuch des Deutschen Volksliedarchivs Freiburg, edited by Michael Fischer and Fernand Horner, 311–325. Münster: Waxmann, 2012. Gilbert Finnegan, Marianne. Das gab's nur einmal. Verloren zwischen Berlin und New York. Zürich: Diogenes, 2007. Schlör, Joachim. “Leerstelle Berlin 1951: Robert Gilbert und die Folgen der heillosen Jahre.” In Zwischen den Stühlen. Remigration und unterhaltendes Musiktheater in den 1950er Jahren, edited by Nils Grosch and Wolfgang Jansen, 87–113. Populäre Kultur und Musik, Vol. 5. Münster: Waxmann Verlag, 2012, 87-113. Robert Gilbert Archiv, Archiv Darstellende Kunst, Berlin, Germany. Robert Gilbert Files, Landesamt für Entschädigung Berlin, Berlin, Germany.